Mindspring Foundation is a proud sponsor of Song Dong and Yin Xiuzhen’s transformative new exhibition, The Way of Chopsticks, at the Philadelphia Art Alliance (PAA) on view from September 12 through December 29, 2013. Created by two of China’s most acclaimed contemporary artists, the PAA’s 2013 centerpiece exhibition will transform the historic Rittenhouse Square mansion into a three-story multimedia exploration of modern family life in the U.S. and China. Mindspring Foundation’s mission in supporting The Way of Chopsticks at the PAA is to provide a historic city in the United States with an opportunity to explore transcultural themes reflecting the rapidly-evolving history of a country that has been increasingly moving to the global center stage. In addition to the film component of this exhibition, Mindspring Foundation has contributed to the installation of video diary kiosks at sites in Philadelphia neighborhoods (community centers, schools, churches, and non-profit organizations) where visitors may record short statements about an object that helps narrate the story of their own family. These statements can be shared by people of all ages, and in any language. The Way of Chopsticks is ultimately about two objects that only work when used together. We share PAA’s hope that this exhibition will illuminate numerous ways – culturally, generationally, geographically, and aesthetically – that this is true for people, too. The PAA, as an organization devoted to enhancing the public’s understanding of material culture, manufacture, handmade goods, and decorative traditions and conditions of fabrication, offers American audiences with an unique environment to view the work of Chinese contemporary artists’ interpretation of material culture through a different lens. Instead of a large "white cube," the PAA’s site is rich in architectural detail, which challenges artists and viewers alike in a grand setting with domestic proportions. There is an intriguing tension inherent in inviting two artists who use humble materials in their work to create something new in a mansion built in 1906 on Rittenhouse Square. From a familial, cultural and generational perspective, The Way of Chopsticks also examines China’s significant shift toward a nation of individuals, using a domestic setting to reflect on these complex ideas. Song and Yin's work addresses family and the marking of time through generations with physical objects. There is no richer metaphor for the passing of one generation to the next than the heirloom. The field of contemporary craft – both at its avant garde fringe and within its traditional heart – is powerfully connected to the home and the body. Studio jewelry, textiles and clothing, furniture and lighting all speak to daily existence and family life, and a particular consciousness of maintaining tradition while planning to pass on special and unique objects to the next generation. Song Dong has been a prominent figure in the Chinese art world since the early 1990s when he first came to attention through performances such as Breathing. Song Dong’s conceptually based practice embraces performance, installation, video and photography, but the references are always highly personal, based on his own life experience and that of his family. Recent important exhibitions include Waste Not (2009) based on his mother’s possessions accumulated over a lifetime and exhibited at the Museum of Modern Art (MoMA); and The Wisdom of Poor People (2005-2011) at the Ullens Center for Contemporary Art (UCCA), Beijing, in 2011. Yin Xiuzhen was one of China’s first female artists to gain recognition in the early 1990s, conceptually oriented and active in performance and installations throughout China and internationally. Like her husband, Song Dong, the artist uses references closely related to her family and daily life experience in Beijing. Although she works in many types of media, she is widely recognized for her use of textiles in Collective Subconscious for Projects 92 at MoMA New York in 2007. In the same year, Yin Xiuzhen also represented China at the Venice Biennale. 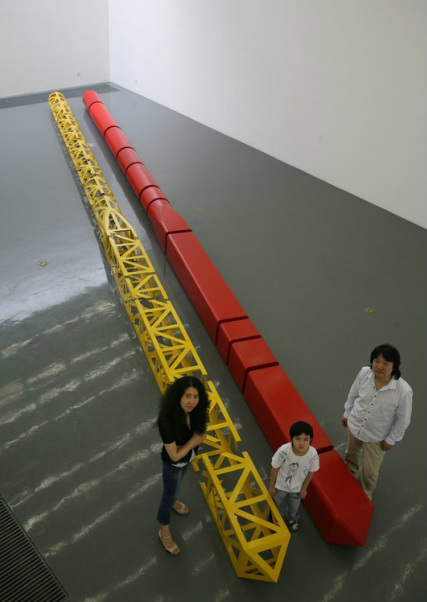 Since 2001, the Beijing-based husband-and-wife artists, who each have distinct and thriving careers of their own, have collaborated on a signature long-term conceptual art project that balances the importance of independence and partnership: They create singular large-scale chopstick sculptures, built according to certain agreed-upon parameters but completed in isolation. Neither artist knows what the other will do until the final sculptures are revealed and joined together. The artists believe that chopsticks serve as an ideal metaphor for family: Just like the everyday domestic objects they create, they feel they could not function — creatively or as parents — without each other. 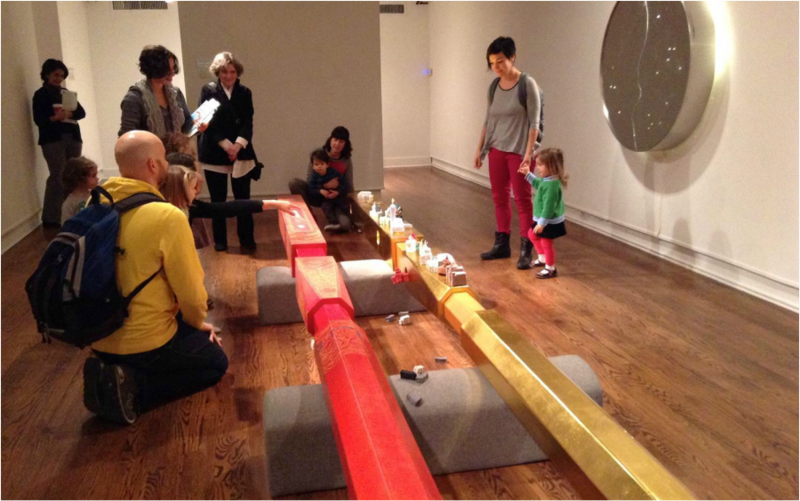 The Way of Chopsticks carries the potential to reach audiences of all ages, engage families, and establish a connection between Philadelphia’s growing Mandarin-speaking population with the city’s vibrant cultural sector. Mindspring Foundation’s support of this exhibition underscores our mission to inform and educate diverse audiences in the US and beyond to develop sustainable conversations and relationships across cultures and communities. Copyright © 2013-18, Mindspring Foundation. All rights reserved.